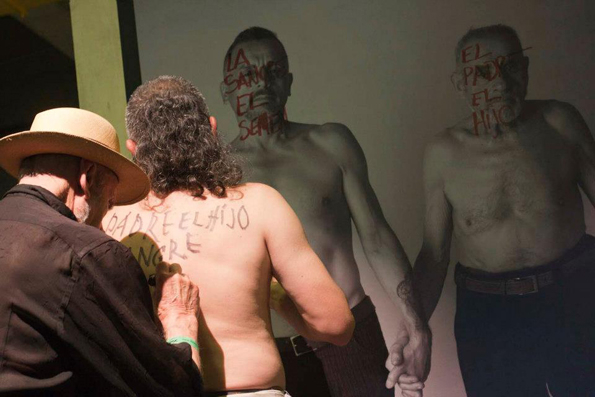 As the Oscar-nominated film No continues to stir controversy in Chile, Chilean performance artists collaborated at the Encuentro in São Paulo. We in the Americas do not know each other. Yet, we share histories of conquest, colonialism, slavery, land grab, etc. We wanted to create a space where artists, scholars and activists who worked at the intersections of performance and politics could congregate to share work, think together and have conversation. There is a randomness to who you meet there, who you work with and who you become friends with. You cannot work together if you don't know each other. Hemi's associate director and editor of e-misférica -- the institute's online journal -- Marcial Godoy-Anativia reiterates this sentiment, "unlike traditional conferences or festivals, Encuentros bring a broad network of people from the Americas into direct dialogue. Everyone participates in everything... and imagine collaborations that benefit from this rich engagement." To facilitate this experience, the formal languages of the Encuentro are Spanish, Portuguese and English. This was the third Encuentro in Brazil. In 2000, the inaugural encounter occurred in Rio de Janeiro and in 2005 the fifth one took place in Belo Horizonte. With Cities Bodies Action: The Politics of Passion in the Americas as the theme in 2013, activities and events were produced in conjunction with three institutional partners in different parts of the city that drew over 600 registered participants. 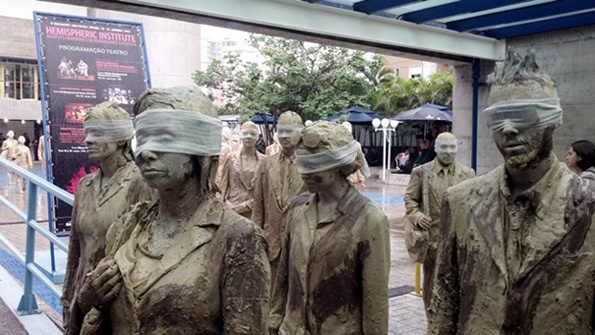 University of São Paulo hosted the workshops, working groups, installations and performances. The cultural organization SESC Vila Mariana housed several exhibitions, presented the larger staged productions including Orfeu Mestiço: A Brazilian Hip-Hopera, Marc Bamuthi Joseph's The Spoken World , and several keynote lectures. There were also a number of roundtable discussions on various issues. For example, "In the Streets: Contemporary Social Movement in the Americas" featured The Yes Men's Jacques Servin, Bolivia's Julieta Parades of Asamblea de Feminismo Communitario and other presenters. Also, there were daily teach-ins on topics such as cities, digital and environmental art, fiestas and carnivals, as well as urban interventions in the metro, public parks and at SESC as in the picture below. Indeed, the city itself was a performance. Attendees included Leda Martins, poet, dramaturge and Hemi board member professor at Universidade Federal de Minas Gerais, which hosted the 2005 event, and Wesleyan University Center for the Humanities Andrew W. Mellon postdoctoral fellow, Lucian Gomoll, former director of Museum and Curatorial Studies (MACS) at UC Santa Cruz, University of Miami, associate professor of Modern Languages and Literatures, and board member Lillian Manzor as well as Vivian Martinez Tabares, editor of Cubas' Conjunto, the prominent theatre journal of Casa de las Americas. Tabares was honored as one of the Institute's 2013 senior fellows. There were performances by the stalwarts, La Pocha Nostra, Carmelita Tropicana and Regina José Galindo. Stephen Lawson and Aaron Pollard, as the artist duo 2boys.tv, were attending their third Encuentro to date. They did short pieces at the nightly cabaret stage as well as the collaborative Tightrope: A Theatrical Song Cycle for the Forgotten, which Lawson explains, "incorporates local queens and gender queer performers from the community in which it was produced, and the final outcome is extremely special and unique, an experience that can only happen in that one place with this one group. It is a risky proposition, unpredictable, intense and time consuming, but as a platform for cultural exchange we have discovered it to be extremely meaningful and resonant for everyone involved." In the evening, after a full day of activities around the city, Trasnocheo, the nightly caberet stage, was held at the third official venue, SP Escola de Teatro. The master of ceremonies was Argentinian performance artist Susana Cook. For the NYC-based Cook, "The Trasnocheo is a place for experimentation, for professional and new artists to meet and share a stage." Cook noted that participants would find the energy to attend the not-to-be-missed event, which often inspired conversation well into the morning after over breakfast." There were regulars such as Micha Cardenas (U.S.A) Marcela Fuentes (Argentina/U.S.A.) and Nicolas Dumit Estevez (U.S.A./Dominican Republic) who presented The More I Dance, an endurance piece, every night during the week. Newcomers from the U.S. included members of 2050 Legacy, Katrina De Wees, Magno Assis (Brazil) and many others. The full program can be accessed here. The gathering offers a big opportunity to see work by people from different countries who are struggling with defining the relationship between art and politics... Some are seeking a way to work out traumas and social pain... there are lots of opportunities to discuss this and think about ways to theorize works. It helps to clarify in your mind what art is for you. I was there to represent Wesleyan University and participate in the working group "Curating Performance: Re/Activation Strategies" convened by Gomoll, which revolutionized my project, VooDooDoll. In addition to presenting excerpts from this work, I made my Trasnocheo debut with an impromptu experimental piece on the 2010 Haiti earthquake collaborating with persons I met the day before. The Encuentro is just the kind of space that inspires risk taking. Although I speak neither Portuguese nor Spanish, I remained thoroughly engaged albeit with a keen awareness of the paucity of black presence within this conceptual hemisphere. My most transformative encounters were when I was completely clueless, as in the Teatro Da Vertigem presentation of Bom Retiro 958 Meters -- a site specific performance in the city's garment district that explores the intersections of identities, consumption and global capitalism. Side note, it is guaranteed to blow your mind and make you rethink what theater is. The city, as it always does, will heavily inflect the experience. I hope we will concentrate on the theory and practice of festivity... Montreal as the city of manifs, manifestations. We will consider what it means to choreograph social movements in a North American city that prides itself on hosting year-round festivals of art, music, film, cultural performance, technological experimentation, poetry, anarchism, circus arts, and puppetry, not to mention Francophonie itself. Indeed, with the persistent active presence of Canada's aboriginal Idle No More movement and an ethnically diverse population that includes Caribbean, Arab and South Asians among other groups, Montreal's Encuentro is particularly well-positioned to be representative of the hemisphere as it provides space for even more productive collisions.